Simply apply the gel to the area and rub with the included hand piece. In as little as 15 treatments, you will see results. The DermaWave is a revolutionary machine that painlessly and quickly treats problem areas. Relief is only a few short treatments away with the DermaWave machine. 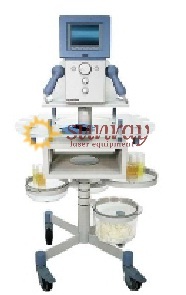 SunrayLaser.com carries quality refurbished laser equipment including the DermaWave Mesotherapy. Our team of expert technicians not only evaluate the quality of the products we carry but we make sure they are ready to use once purchased and installed in your place of practice. This reconditioned device is no exception. We have calibrated it to fit today’s standards of safety and effectiveness. Have questions? No worries, our device specialists are just an email away. Feel free to get in touch with us using the contact form below and we would happy to assist you. Inquiries on product specifications and price quotes are most welcome.